Acerola (Malpighiaglabra L.) is known for its high content of Vitamin C, up to 4.5% Vitamin C per fruit compared to 0.05% found in a peeled orange. Acerola's Vitamin C content fluctuates according to season, climate and maturity of the fruit. Most commercially-grown Acerola is harvested while still green to preserve the most Vitamin C, which reduces as the fruit ripens. 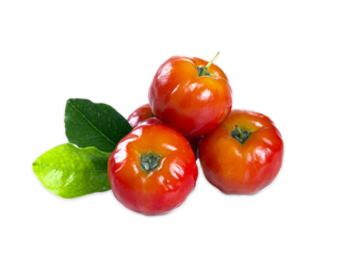 Compared to oranges, Acerola provides double the amount of magnesium, potassium and pantothenic acid. It is also a significant source of Vitamin A.